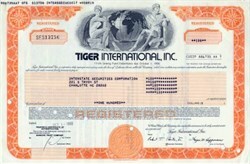 Beautifully engraved certificate from Tiger International, Inc. issued in 1980. This historic document was printed by the Jeffries Banknote Company and has an ornate border around it with a vignette of two allegorical people sitting on marble benches, with a globe placed in between them. This item has the printed signatures of the Company's Chairman of the Board and Corporate Secretary and is at least 16 years old. Flying Tiger Line changed its name to Tiger International in 1974 and merged into Federal Express in 1989.